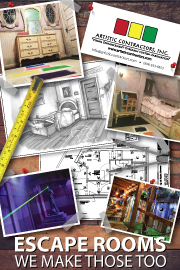 Learn about how Artistic Contractors gives back to our surrounding Northeast Florida communities. Jacksonville Beach Deck The Chairs (JBDTC) is an annual lighted sculptural exhibit using the iconic chairs of The American Red Cross Life Saving Corps. Marking its fifth year in community service, JBDTC gathers community to decorate and display the Beaches lifeguard chairs during the month of December to promote local business, instill public pride, and share cultural diversity through creative expression. Free and open to the public, the light display aims to provide a wholesome and festive downtown during the holidays. All net proceeds from JBDTC will benefit the historic Volunteer Life Saving Corps of Jacksonville Beach. Deck The Chairs, Inc. is a 501(c)(3) Public Charity. Saving Labradors throughout Florida one dog at a time! We have found 16 labs furever homes, and counting. Thank you to everyone who opens their home to our fosters! Our community is excited about our vision to impact the South Georgia and North Florida region through the Christian financial professional community. Our Mission: "To engage, equip, and empower Christian financial advisiors to communicate Biblical wisdom to their clients, apply professional principles in their practices, and live out their faith in their marketplace for Kindgom impact." This is an exciting and challenging task. Northeast Florida Christian Foundation (LCF) - "Smart Christian Giving"
That's the simple concept behind The National Christian Foundation (NCF). Founded in 1982 by Larry Burkett, Ron Blue, and Terry Parker, NCF and our nationwide network of Local Christian Foundation (LCF) affiliates have granted more than $1.8 billion to over 15,000 churches and ministries worldwide. BEAM helps temporarily at risk beaches area residents with free: Food, Housing Assistance, Utility Bill Assistance, Tax Preparation, Medical and Mental Health Services, and much more. Homeless Meal Center provides: Not-for-profit Fund Raising, On-site Auction and Storage, Supply and Delivery of meals for Thanksgiving and Toys for Christmas to shut-ins and families in need.